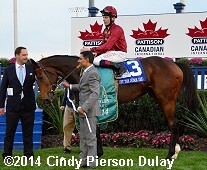 The Canadian International was one of three graded stakes run on the Woodbine turf on Sunday. 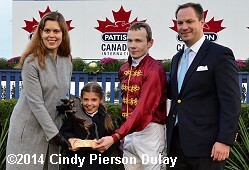 The distaff counterpart to the International is the $500,000 E.P. 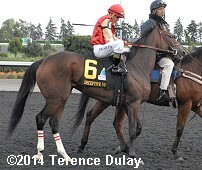 Taylor Stakes (G1) for older fillies and mares going 1 1/4 miles over the good-to-firm (GoingStick 9.6) course. Just the Judge was sent off as the 8-5 favorite in the field of 8, exiting third place finishes in the Princess Elizabeth (G3) at Epsom, the Pretty Polly (G1) at Curragh, and the Beverly D (G1) at Arlington. 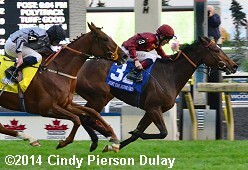 In to challenge her included 5-2 second choice Deceptive Vision, winner of the Canadian (G2), the major local prep for this race, and 4-1 third choice Odeliz, third in the Lavarack (G3) at Gowran Park after finishing second in the Atalanta (G3) at Sandown. Jockey Richard Kingscote sent 9-1 Wall of Sound to the front and she set fractions of 24.51, 50.88, 1:16.41, and 1:40.57 while stalked by Deceptive Vision and 13-1 Royal Fury. Entering the lane, Wall of Sound continued to lead but at the 1/8 pole, Just the Judge, 6th early, moved up to take over the lead. 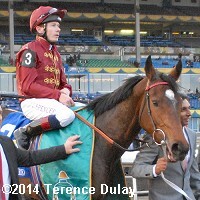 Kept to task by Jamie Spencer, Just the Judge held off late-running Odeliz by 1/2 a length in 2:03.47. It was another 2 lengths back to Deceptive Vision third. Right: The trophy presentation for the E.P. Taylor Stakes. Left: Just the Judge in the post parade. Spencer added, �Obviously the race was very unsatisfactory because I had to go to Plan B from the start because she kind of jumped awkwardly from the gate. You can�t panic then, you have to take a different route. I was in amongst horses from probably 5f out to about the 3/8 pole and it was very, very tight where I was. Then she had to make a little bit of room for herself early in the stretch." Right: Just the Judge heads back to the barn after the race. 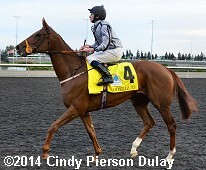 She is a possible starter in the Breeders' Cup Filly and Mare Turf before returning home to be sold. Left: Second place finisher Odeliz returns after the race. 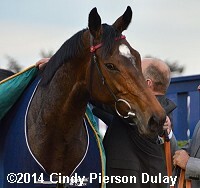 The 4-1 third choice raced in last 6 lengths off the pace under jockey Ryan Moore then rallied to get second. 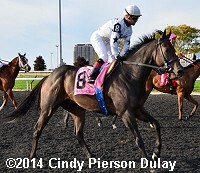 The Karl Burke trainee improved her record to 3 wins, 5 seconds, and 3 thirds in 15 starts, earning $271,365 for owner Barbara Keller. Right: Third place finisher Deceptive Vision in the post parade. The 5-2 second choice stalked the pace in second under Eurico Rosa da Silva but could not hold off the first two. The Malcolm Pierce trainee improved her record to 4 wins, 2 seconds, and 2 thirds in 8 starts, earning $402,355 for owner-breeder Sam-Son Farm. 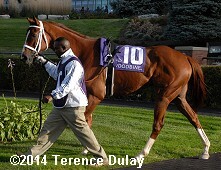 The $300,000 Nearctic Stakes (G2) features top older horses sprinting 6 furlongs on the turf. 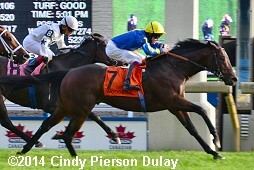 Calgary Cat was sent off as the lukewarm 3-1 favorite in the field of 10 off his win in the Bold Venture (G3). In to challenge him included 7-2 second choice Excaper, fifth in the Play the King (G2), and 9-2 third choice Caspar Netscher off a fifth place effort in the Bengough (G3) at Ascot and winless since the 2012 German 2000 Guineas (G2). Jockey Justin Stein sent 9-1 Black Hornet loose on the lead through fractions of 22.12 and 44.52 while about 3 lengths in front of 7-1 Dreamsgonewild, in turn 4 lengths ahead of Excaper. 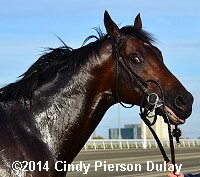 Through the lane, Black Hornet appeared homefree with a 3 1/2 length lead in midstretch through 5/8 in 56.43. However, Caspar Netscher, sixth early, made steady progress on the outside and rallied to get up by 3/4 length in 1:08.97. 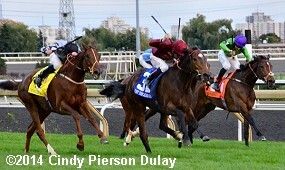 It was a neck back to favorite Calgary Cat third. Left: Second place finisher Black Hornet returns after the race. The 9-1 shot set the pace under Justin Stein but failed to hold off the winner. The Pat Parente trainee improved his record to 4 wins, 4 seconds, and 3 thirds in 15 starts, earning $460,482 for owner Winview Racing Stable. 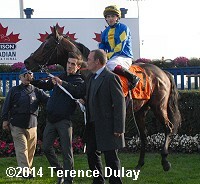 Right: Third place finisher and beaten favorite Calgary Cat in the paddock before the race. 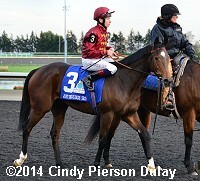 The 3-1 choice raced 4th under Eurico Rosa da Silva then put in a rally but was outfinished by the first two. The Kevin Attard trainee improved his record to 6 wins, 3 seconds, and 1 third in 14 starts, earning $315,180 for owner Steve Chesney and Cory Hoffman. 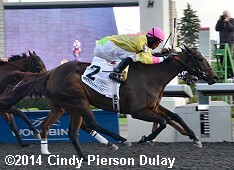 The undercard feature on Sunday was the $150,000 Ontario Fashion Stakes (G3) for older fillies and mares sprinting 6 furlongs on the Polytrack. 21-1 Cryptic Message set fractions of 22.00 and 44.41 under Eurico da Silva while stalked by 7-2 Goldstryke Glory and 81-1 Casablanca Kiss. Entering the lane, Cryptic Message continued to lead through 5/8 in 56.58 but 3-1 second choice Native Bombshell and 9-5 favorite Disco Barbie rallied past her at the 1/16 pole. Native Bombshell outfinished the favorite by a neck in 1:09.48. It was another 1 1/4 lengths back to Cryptic Message third. 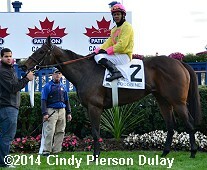 Winning jockey Patrick Husbands said, "She gave me everything I asked her for. The race had a lot of speed. She broke on top, but she relaxed good so I had a good trip. When I let her out, she gave me everything."